Preservation – Bone grafting can be used to limit or prevent bone recession following a tooth extraction, periodontal disease, or other invasive processes. For example, bone grafting is commonly used to fill the socket folllowing an extraction to help preserve the shape of the bony ridge, help prevent resorption, and provide a stable foundation for future implant placement. Initially, the dentist will thoroughly examine the affected area in order to assess the general condition of the teeth and gums. If periodontal disease is present or the adjacent teeth are in poor condition, these factors will be fully addressed before the bone grafting procedure can begin. The dentist will also recommend panoramic xrays in order to assess the precise depth and width of the existing bone. On occasion, a cone beam 3D scan or CAT scan may be recommended to determine the bone condition. Depending on these results, the oral and maxillofacial surgeon may also anesthetize and explore the area in order to determine what kind and how much bone is required. There are several types of bone grafts. 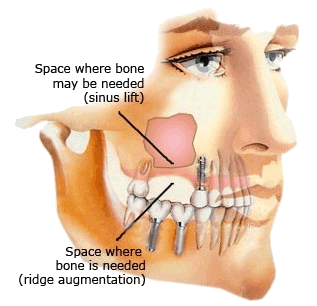 Your oral and maxillofacial surgeon will determine the best type for your particular condition. Autogenous Bone Graft - Harvested from the patient’s own body (usually from the posterior part of the lower jaw or the chin). This method is sometimes preferred because it produces very predictable results.